For many adults, the prospect of spending months or even years wearing metal brackets and wires just isn’t in the cards. Thankfully, there are alternative ways to achieve straight, gap-free teeth that you can show off proudly. At J.B. 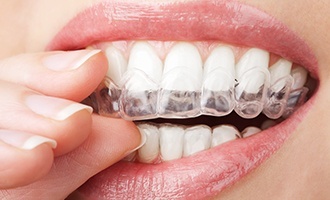 Dental, our team is proud to offer Invisalign Clear Braces, which features the use of clear, customized aligners that slide right over teeth comfortably and are barely noticeable when worn. Dr. Joanne Bancroft would love to welcome you in for a consultation here in Westminster, CO and help you determine whether or not you’re the right candidate for this modern service – contact us today! After performing an initial consultation and capturing detailed impression of the patient’s teeth, the Invisalign Laboratory will design a series of high-quality aligners that are sent back to our practice. 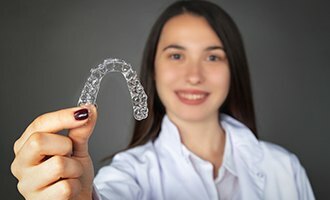 Each unique aligner represents a different stage of the patient’s gradual tooth movement, and their job is to wear them as directed (typically for a few weeks at a time) before switching to the next aligner in the set. It’s crucial to keep the aligners in the mouth for 22 hours or more a day, only removing them to eat, brush, and floss. Additionally, Dr. Bancroft will want to see patients for a brief progress appointment around every six weeks. During this time, she will also provide the next few aligners needed for treatment. While every case is unique, most patients can expect to be finished with Invisalign after 9-18 months of wear. Like the name clearly implies, Invisalign aligners are pleasingly subtle and very hard to notice in everyday life. Patients can focus on living life to the fullest instead of constantly worrying whether or not people are staring at their braces! Because the Invisalign aligners are removable, no changes to your diet or oral hygiene routine are required. The aligners are made of a smooth, comfortable plastic, with no poking orthodontic wires or uncomfortable tightening to worry about. While traditional braces may require upwards of 2-3 years to be fully effective, most patients will be finished with Invisalign treatment long before that.